Critics called Tom Christensen's 2002 Playscape debut, Paths (PSR#J111601), "smart and inviting" (AllAboutJazz.com), "a remarkably varied, original, and arresting work" (Boston Globe), and "an artistic endeavor of the highest order" (Saxophone Journal). "By the end of the day," wrote All Music Guide reviewer Glenn Astarita, "it becomes outwardly apparent that Christensen possesses the goods to be a major force within the global modern jazz arena." His second Playscape release, and third overall, finds the multi-instrumentalist/composer drawing inspiration from the intermingling poetry and artwork of the so-called New York School. Seven new original compositions add a musical dimension to the work of poets Frank O'Hara and Kenneth Koch and painters Grace Hartigan, Jasper Johns and Jackson Pollock. Intelligent is also a good word to describe the music of multi-reed player and composer Tom Christensen. He glides through seven original works on his third CD, New York School, just issued by Playscape Recordings, and it's a satisfying aural experience. 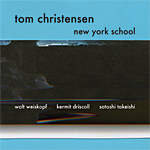 Reedsman Tom Christensen's third and newest CD, New York School, may be the best jazz album of the year, but he hasn't appeared out of nowhere; his years of sidework--for example, with the Toshiko Akiyoshi Jazz Orchestra--and his two previous albums under his own name have steadily impressed people in the jazz world, converting them to his multi-instrumental virtuosity (he plays tenor and soprano sax, oboe, English horn and various flutes and clarinets, all well) and his unique and austere compositional skills. New York School...represents a perfect Exhibit A of modern jazz—a seven-song feast that serves up the collective’s remarkable instrumental dexterity, the two-reed interplay of the leader and Walt Weiskopf, the pliant bass expertise of Kermit Driscoll (yes, he is back), and the truly sui generis percussion work of Satoshi Takeishi. New York School is a record like few others. Seen from its compositional, instrumental, or artistic dynamic, it is an ebullient release that soundly reflects the world in which we all live, with a nod to the artisans of the past. ...the foremost comparison that comes to mind is Yusef Lateef, ranging from his Impulse! days to the more recent work percussionist Adam Rudolph. Christensen and his reeds-wielding sidekick Walt Weiskopf stray around rhythmic assertions, playing close attnetion to Kermit Driscoll’s likeminded bass as they work together flying over function over form, a displaying of rhythmic decenteredness that coaxes the ear away from structures. It’s part free-bop, part global jazz. Exotic percussion, a lyrical bassist, and two inspired multi-instrumentalists provide plenty of variety. Like the works of art that Christensen's music represents, these seven pieces carry deep meaning in their intricate framework. The quartet's impressions of The New York School provide much to consider; some of it quite serious and some of it loose...welcome musical expression. It's smart, finely tailored postbop with an emphasis on craftsmanship over flash—just the sort of session that guitarist Michael Musillami would pick for his label, Playscape, which has come to specialize in this sort of no-nonsense modern jazz. "With the (now traditional) post-Ornette, piano-less quartet line-up of upright bassist and percussionist backing a two horn front line, Christensen's quartet has a surprisingly vast color palette to draw from. With the leader doubling on eight different reed instruments alone, from tenor saxophone to wood flute, combined with percussionist Satoshi Takeishi's arsenal of available devices, the quartet has a veritable world of sound at their disposal. With episodic multi-part compositions and a tendency to vacillate back and forth between the aforementioned Eastern and Western inspired excursion, Christensen is definitely a talent on the rise." "Horn multi-instrumentalist Tom Christensen's third release in six years is a pleasure from start to finish because it manages to simultaneously embrace thought and emotion, interweaving the two in constantly evolving, often unpredictable ways. Some of the starkest and most penetrating moments come through on ?In Memory of My Feelings,? which pairs bass clarinets and soprano saxophone with deep, ringing, ritualistic percussion, communicating a sense of melancholy loss matched with a seemingly paradoxical feeling of rebirth. One of the best records of 2005." "Playscape seems to specialize in this kind of jazz: just a little left-of-centre rather than way-out-there, but done with enough conviction and idiosyncracy to set it apart from the pack. Tom Christensen is a formidable multi-instrumentalist: on this album alone he plays tenor and soprano sax, oboe, English horn, clarinet, bass clarinet, alto flute and wood flute. This is a thoughtful, distinctive album...well worth hearing." "...the trajectory of a work can be flat if an artist lacks imagination and creativity. Christensen shows beyond the pale of doubt that he is imbued with both as he molds this stunning piece of work. Christensen's use of instruments is undoubtedly another manifestation of his artistry...an experience that will reside in the soul for a long, long time." "...a composer of remarkable depth and invention. His latest release, New York School, is one of those very rare recordings that manages to create its own musical universe. Throughout, the only thing more compelling than Christensen?s writing, which has a kind of contemporary chamber ambience, is the playing from everyone involved, with musical choices that are never less than perfect...New York School captivates with a sense of adventure and exploration while remaining completely approachable." "You should be most familiar with the rhythm team, Kermit Driscoll, from his many years with Bill Frisell, and in-demand percussionist Satoshi Takeishi, who works with Ned Rothenberg, Myra Melford and dozens of other projects. 'Further Digressions' was inspired by a Frank O'Hara poem and a Jackson Pollock painting and is well written with a perfect blend of tenor sax and bass clarinet. The exquisite combination of English horn and clarinet on 'Your Strange Son' is a most eloquent gem, delicate and haunting, sublime writing and performance as well. Another wonderful disc from the rich and spirited Playscape catalogue."